Atherosclerosis affects an overwhelmingly large percentage of the world population despite varying degrees of severity and progression. The formation of fatty plaques, as depicted bellow, is the hallmark of the disease and, in advanced stages of atherogenesis, results in thickening of the arterial wall and the subsequent protrusion into the artery lumen. 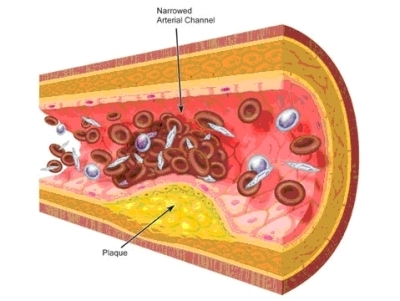 While generally asymptomatic in early stages, the symptoms of atherosclerosis usually present as a consequence of artery stenosis, or narrowing, secondary to plaque protrusions into the lumen space. Stenotic lesions are the central focus in vascular intervention and are characterized by their effect on blood flow which supplies the oxygen demand of the underlying tissues. The schematic bellow depicts a lesion of length Ls and area As that affects an artery with normal diameter represented by An. 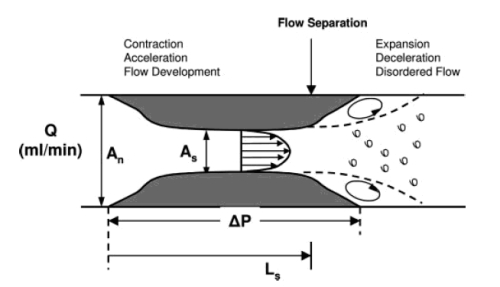 Pressure Drop (∆P): This results from frictional losses in the entrance and along the length of the stenosis, which are linearly dependent on flow rate, and inertial losses due to the sudden expansion which increase with the square of flow rate, as discussed later. Increase in Resistance (R): The increase in vessel resistance is an obvious result of interluminal occlusion at the lesion site that is characterized as a percent reduction in internal diameter. It’s important to know that resistance has a 4th order dependence on internal diameter. 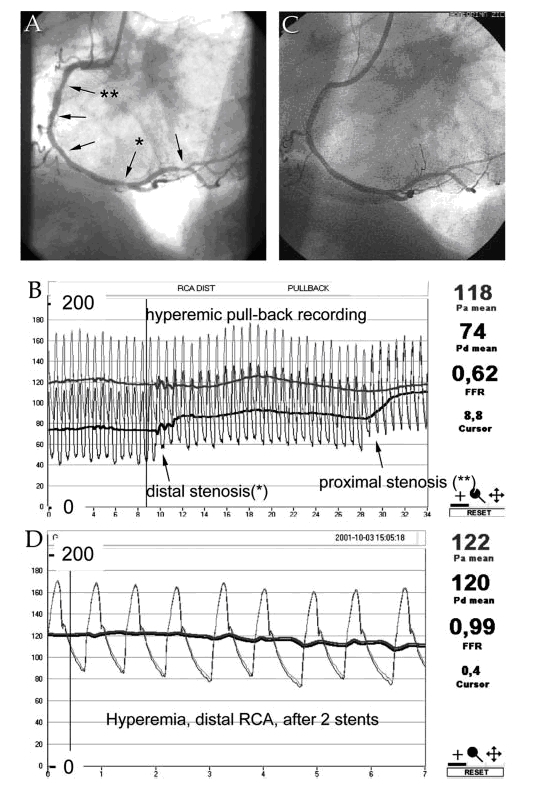 Reduction in Maximal Flow (Qmax): The simultaneous drop in pressure and increase in resistance limit the maximal flow across a stenotic lesion since flow rate is directly related to pressure and inversely related to resistance. Here (see figure bellow) we observe a clinical example of a patient with 63% stenosis (filled circles) and normal reference vessel of an age-matched control subject (open circles). 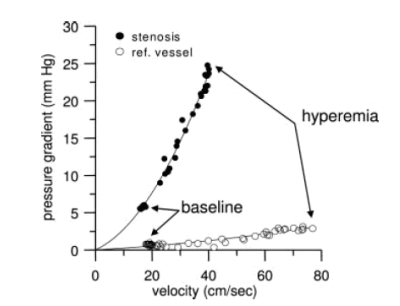 As suggested earlier, in going from a normal vessel segment to a diseased vessel segment, not only does the ∆P vs. velocity curve become curvilinear as a result of post-lesion pressure loss due to expansion, but also maximum velocity through the vessel is decreased as well. The magnitude of this effect is commonly used to characterize the physiological significance of a lesion in question. The concept behind Angioplasty, or Transluminal Percutaneous Coronary Intervention, is fairly simple. First, a guide wire with an extremely small diameter of 0.36 mm is positioned just past the lesion site in the corresponding artery. 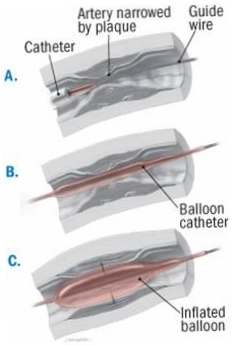 A deflated balloon catheter is then advanced along the guide wire into target site (verified by Fluoroscopy). After positioning the balloon in the desired location within the artery, the operator inflates the balloon to push the accumulated plaque back along the length of the artery wall. The figure bellow demonstrates the typical pressure data (B and D) and anatomic data (angiograms A and C) gathered in the catherization laboratory of the hospital. 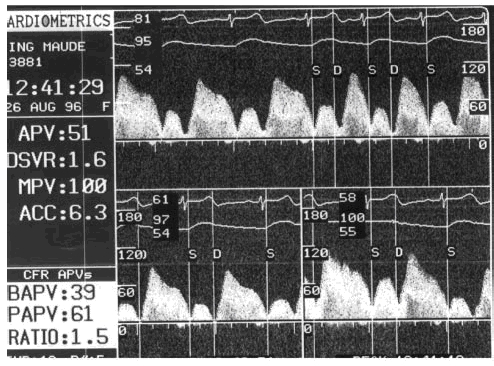 One can see the drop in pressure as a pressure wire is advanced past the lesion site as evidenced by the separation between the bold lines in figure B that represent the means of pressure cycles in the aorta and wire tip. FFR or Fractional Flow Reserve is the ratio of proximal to distal pressure of the stenosis and is displayed in both pressure tracings. This is an important parameter in both lesion diagnosis and treatment evaluation after angioplasty or revascularization procedure. The figure bellow is a Doppler flow velocity tracing in the stenotic artery showing the ratio of hyperemic (maximal) to basal (resting) flow called Coronary Flow Reserve or CFR. This number is displayed in the lower left corner denoted by RATIO. The above Doppler data complements the FFR data discussed previously.